Connor Stewart Martin, wrapped in bandages and lumbering toward you with arms outstretched, describes a Halloween-themed game for CrossFit Kids. Many children associate Halloween with trick-or-treating and wolfing down mountains of candy. 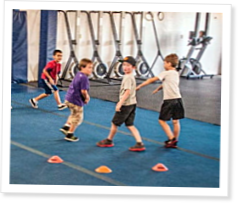 This CrossFit Kids game is perfect for getting young athletes thinking about fitness instead. Easy to set up and play, Mummy Circle can also be used as a warm-up activity, or you can scale it up by changing the way kids flee from the mummy. Dr. John Ratey, author of Spark: The Revolutionary New Science of Exercise and the Brain, talks to Chris Cooper about movement, the mind and CrossFit. Can burpees help with math homework? Sean McCue introduces a simple game of sprinting that requires no equipment at all.